Here is an incomplete list of the sustainable energy and climate change books I read in 2009 (actually, a few also scraped in from late 2008). I’ve provided a 2 — 3 sentence summary of each book (from my perspective) and a Rating out of 5. Some books have been reviewed in more detail on BNC already — enter from the title of the book in this website’s search box to find the review. Solar Credits – just bad policy! 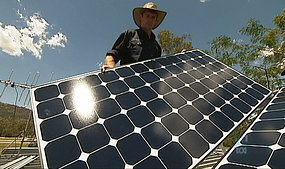 From June 9, 2009 when a householder is seduced into signing across Solar Credits associated with their small scale Solar, Wind or Hydro generation schemes, they will continue to reduce their emissions yet for every deemed megawatt hour (MWh) created, they will displace 5 MWh of accredited Renewable Energy already required under Australian Law. They will be causing a net 4 MWh to be continued to be produced from fossil fuel sources and therefore will cause more greenhouse gas emissions and do more harm to the environment than doing nothing. When the Government released its exposure draft legislation on the design of the Renewable Energy Target in December 2008 there were many issues created in the legislation that should have been relatively straight forward. In my submission on the Exposure Draft, I raised concerns including that the Expanded Renewable Energy Target did not neccessarily secure the Government’s 20% of electricity sourced from renewable energy by 2020 Election Pledge, and might also count the voluntary efforts of individuals and businesses towards the expanded target effectively creating a ceiling on what could otherwisede be achieved. Now the Exposure Draft Legislation has been re-released and is due to be presented to Parliament next week. There have been some changes such as maintaining the mandatory component at 45,000 gigawatt hours (GWh) per year from 2020 through to 2030, rather than eroding this requirement from year 2025 onwards. In this posting I would like to concentrate on the policy consequences of the Solar Credits proposal. Why has the Government moved to a Solar Credits mechanism? The reason that the Government has moved from its Small Scale Generation Unit Rebate Scheme to a Solar Credits Scheme is simply about Government cost cutting. The current scheme was costing the Government too much money and the replacement Solar Credits scheme shifts the cost burden back to all electricity consumers. What has the Government Actually proposed? The Government has proposed that a multiplier be used in relation to the deemed output from small scale generation units that are eligible to create Renewable Energy Certificates (RECs). Between 9 June 2009 and 30 June 2015, instead of just 1 REC being created from 1 deemed MWh of generation, a multiplier can be used to ‘create’ more RECs. The Australian Government is belatedly acknowledging the harm that its proposed Carbon Pollution Reduction Scheme will have on the effectiveness of voluntary actions taken to reduce emissions. The media release from the Prime Minister, Treasurer and Minister For Climate Change and Water on May 4, 2009, stated that : “The Rudd Government has listened to Australian households who have raised concerns that their individual efforts to reduce emissions will not be adequately taken into account under the CPRS”, and a number of measures were proposed. So did the Government listen enough and has it has fixed the problems in regards to voluntary actions as claimed, or made them worse? Firstly, this discussion is not about the overall target or whether the potential change to the upper end of the Government’s potential target provides sufficient improvement. Secondly, whilst I do believe that voluntary choices for businesses and households to avoid emissions intensive products and services are essential in an effective low emissions economy, this comparison can be seen in my joint submission  with Professor Barry Brook to the Senate Economics Committee. Where do the benefits of voluntary actions currently belong? 1) Energy Efficiency: Without emissions trading, where individuals, households and businesses find ways to reduce their electricity use, fuel use or consumption of other products and services, their greenhouse gas emissions are reduced and National emissions are reduced. 2) GreenPower: Under Australian law, GreenPower works as a donation. Customer emissions are not reduced (despite marketing messages that suggest otherwise ) but new renewable energy is created which serves to avoid emissions from non renewable power stations so National emissions are reduced. 3) Household solar and hot water systems when Renewable energy Certificates (RECs) are sold: Where households esablish these systems, their emissions are reduced, but their RECs are signed across to third parties, either other renewable energy that was already required by law is no longer needed so there is zero reduction in emissions Australia wide or, their RECs are used to create GreenPower that double counts the greenhouse reduction and use benefits as it is sold to other households and businesses negating the additionality of the efforts of the GreenPower Customer. 4) Household solar and hot water systems when Renewable Energy Certificates (RECs) are kept by the householders: Household emissions are reduced and National emissions are reduced. So there are a number of good outcomes and wasted outcomes from current voluntary actions, and I maintain that there is an urgency to either reform GreenPower and electricity emissions accounting or clarify that it is really just a donation system for the benefits to be shared amongst all grid customers in proportion of their use so that the Trades Practices Act (1974) is complied with. (Also note that this matter is about the legal assignment of benefits and has nothing to do with how the grid is used or how inputs or outputs to the grid are measured). The basic problem of voluntary actions under an emissions trading system. 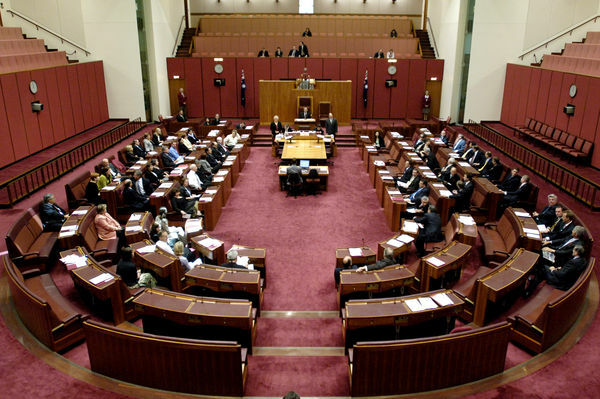 Recently, a Senate Economics Committee was established to investigate the current emissions trading legislation. Tim Kelly and I prepared a submission, which has now been posted on the senate website. It builds usefully on Tim’s earlier post: Carbon tax or cap-and-trade? The debate we never had, which prompted a lot of discussion in the BNC comments. So, as an update to this topic, I reproduce the new submission later in this post. In addition, the Greens negotiated with the Coalition to establish a new Senate Select Committee on Climate Policy, with broad terms of reference (see below). It will report in May. Consider making your own submission to it. a) The choice of emissions trading as the central policy to reduce Australia’s carbon pollution, taking into account the need to: i. reduce carbon pollution at the lowest economic cost; ii. put in place long-term incentives for investment in clean energy and low-emission technology; and iii. contribute to a global solution to climate change. 1. A cap and trade mechanism is by its nature, an all consuming policy instrument that extinguishes the effectiveness of voluntary actions, harming rather than enhancing the evolution of a low carbon economy. 2. With a cap and trade approach, the target is everything as both the emissions cap and emissions floor are locked in. No one can do better than the cap, and so the cap must be a science based al consuming sustainable target pathway that won’t lock in failure. As we don’t yet have the widespread political and economic preparedness to commit to an all consuming sustainable target pathway (either nationally or internationally), the cap and trade mechanism is the wrong approach and we should instead focus on a carbon tax with complementary mechanisms that would transform the economy more effectively than the proposed Carbon Pollution Reduction Scheme (CPRS). 3. A cap and trade approach based largely on cushioning financial impact on business, is the wrong policy instrument to use during economically turbulent times where it is not possible to determine business as usual emissions. The cap and gateway will either be too aggressive and will cause a political backlash, or soft leading to coasting when we should be transforming the economy.